Celebrate all the things that make him a special guy with this complimentary personalized Word Cloud photo frame for men. 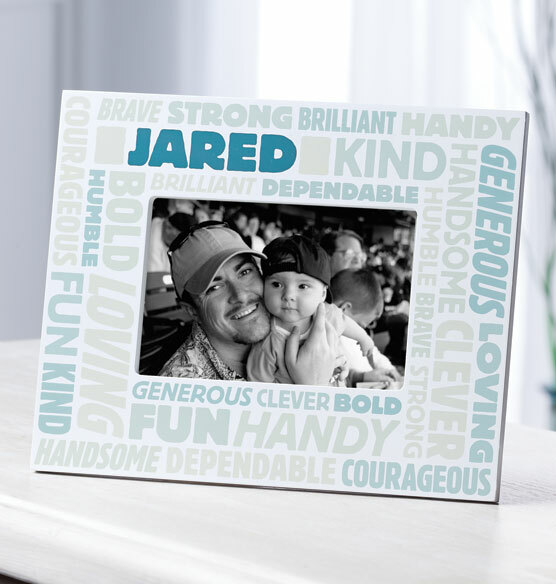 Filled with a variety of kind, masculine words and personalized with his name, this personalized picture frame praises his character and personality. The assorted words on the frame are printed in a variety of visually interesting font types and colors, and are appropriate to men of any age. Who wouldn’t want to be reminded that you think he’s handsome, brilliant, brave and more? The back has both an easel stand and sawtooth hangers so he can display it on a table or wall. Makes a perfect gift idea for an important guy in your life, no matter how young or old. This is the best frame they offer! What size picture fits in the picture part of the frame? BEST ANSWER: Thank you for your question. This holds a 4x6 photo.We hope this information will be of help to you.